This is the monument in honor of Rafael Casanova (1660 - 1743), Chief Councillor of the City of Barcelona in the previous year to the invasion of Philip V troops (Bourbons) during the War of the Spanish Succession. It is one of the two significant statues (the other is that of Josep Moragues) where members of the Catalan government lay flowers to commemorate La Diada, the National Day of Catalonia on September 11th. The historic figure, Casanova, is a subject of controversy between Catalans and some other people in Spain (there are lots of political subtleties behind this topic and I am not going to deal with them). Some facts: Rafel Casanova was appointed Conseller en Cap in 1713, Barcelona was on the Austrian side (Habsburgs) so the city was besieged by Bourbonic troops. The militia led by Casanova and other officers resisted three assaults in a row, until food and powder were scarce and some claims of armistice were made. Nonetheless, rendition was rejected until Barcelona fell in the final assault of September 11th, 1714. Rafael Casanova had been wounded in the leg during battle, and his family hid him from Bourbonic repression declaring, legally (there was a death act), he was dead. Dressed like a friar, he left the city and reappeared after an amnisty in 1719. He died in 1743. Those were times of resistance, heroic resistance, to defend the honor of the city and its inhabitants. The rest is history, and history is always interpreted and reinterpreted according to people's beliefs, but that, is another story. 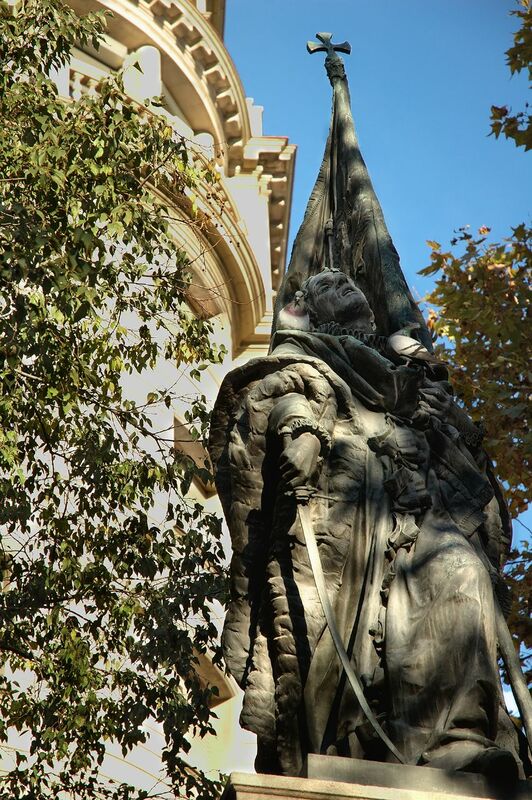 By the way the statue is by Rossend Nobas one of the best representatives of Catalan sculptural realism. Don't miss the omnipresent pigeons! Carlos, I find your words on my blog so touching - I am glad you are enjoying your visits to my paradise as much as I enjoy my visits to yours. Barcelona with its natural beauty, long history, warm, friendly people and great food is always at the top of my travel destinations. Maybe one day we can swap places? Hmmm...that's an interesting idea. When do we start? :) Thanks for your visit Isabella. It is good to hear more indepth background. I would like to do one of the famous pilgrimages. A very powerful picture of a striking statue! Great framing and thanks for the historical research.